With busy jobs, families and lives ourselves, we understand that a well-designed home should not only look great, but it should work too. Our approach is to utilise what you have and make the most of it, considering new layouts and creating bespoke storage. We want your personality to shine through in every design detail. Whether you have a city crash pad or a family home, our designs ensure you have a space that best suits your tastes and needs. Forster Inc was asked to create a flexible work and living space for this grade 2 listed space, while also building in room to store and display their belongings. Our main approach for this project was to simplify the layout. We moved the living space to the front of the flat and knocked through the walls to create a seamless flow to the two spaces. We built customised deep-storage units that show off the family’s belongings and frame the room. Once we moved the bedroom to the quieter back of the flat, we converted this space to be a multifunctional dining, office and spare bedroom, achieved by adding sliding doors to create privacy when needed. We used inexpensive materials – such as painted pegboard – to add texture, and we kept to a basic palette of white and walnut to better highlight the family’s personal items. 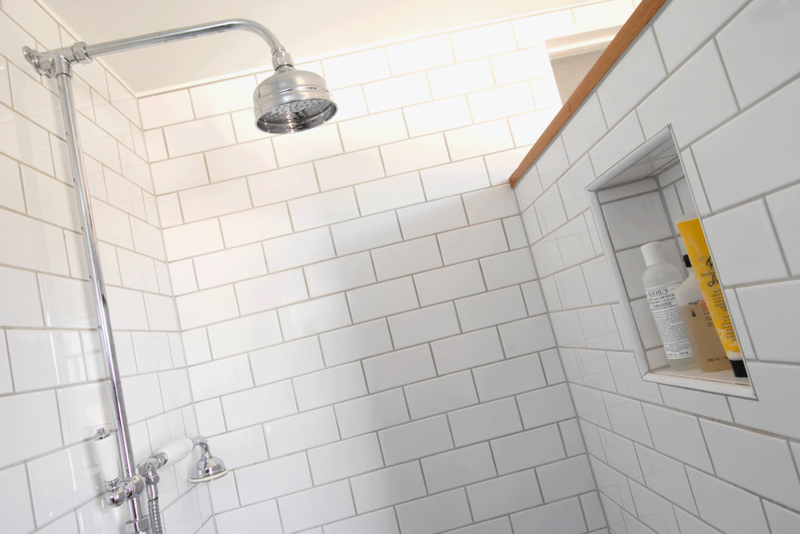 The shower was decorated with metro tiles to maintain the white, clean aesthetic. However, we contrasted this by using traditional fixtures and fittings, in line with the age of the building. 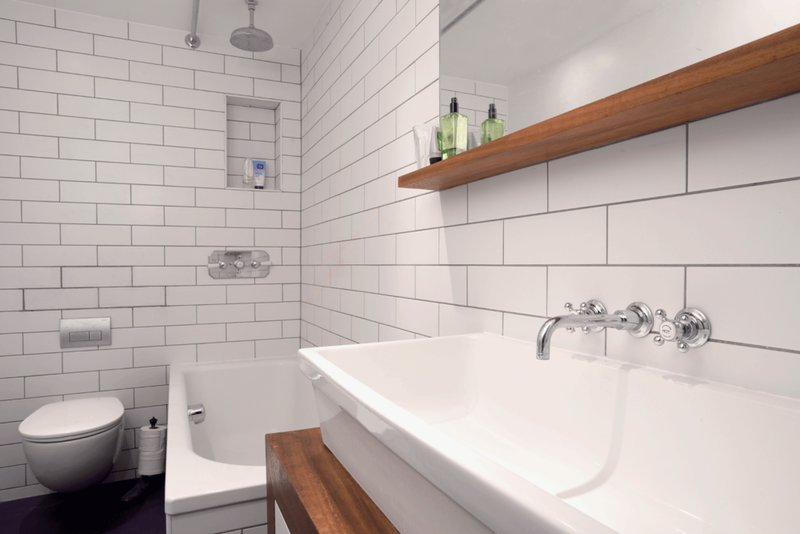 We built recessed cubbies in the shower to store items rather than having any bulky shelves, creating a seamless effect. 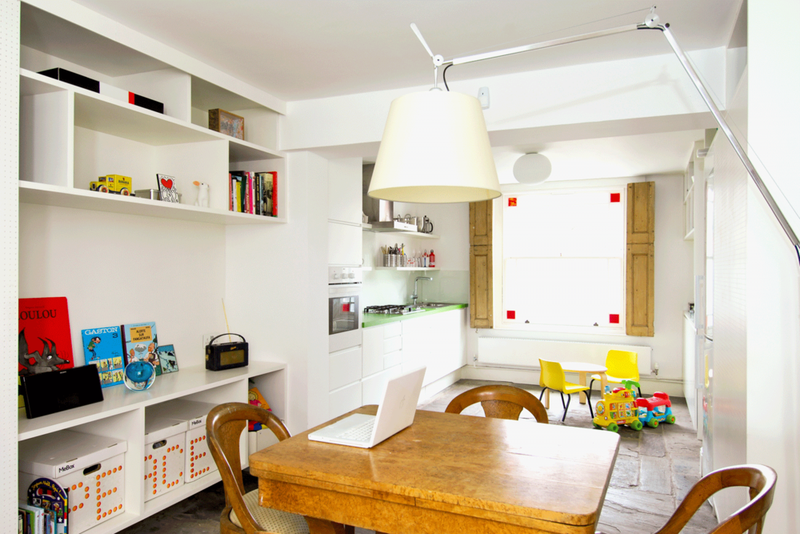 While the family loved their Shoreditch house, they felt their home wasn’t working for them. By rearranging the layout, we created a much bigger space and added two extra rooms. On the ground floor, we flipped the layout around and extended the kitchen. We constructed bespoke kitchen shelving and a built-in wine rack, as well as a large pinboard for the family to stay organised. This room has become their most used space in the house. We introduced modern fixtures into the kitchen, such as a hot water tap, seamless cabinetry and space for a large American-style fridge. The tile backsplash is inspired by the tiles at Shoreditch High Street station. Other design elements feature natural and eco materials. This includes a reclaimed school laboratory table for the kitchen countertop and slate flooring that runs the length of the ground floor. The upstairs layout was cramped and dark, and some architects had advised to completely knock and rebuild the house. However, our approach was to make use of the existing space and simply rearrange the layout, a more cost efficient and less disruptive alternative. By moving the living room downstairs, we added two extra rooms upstairs, giving each family member their own space to work and play. We also built a window to the brand new office space, which brings in more natural light. 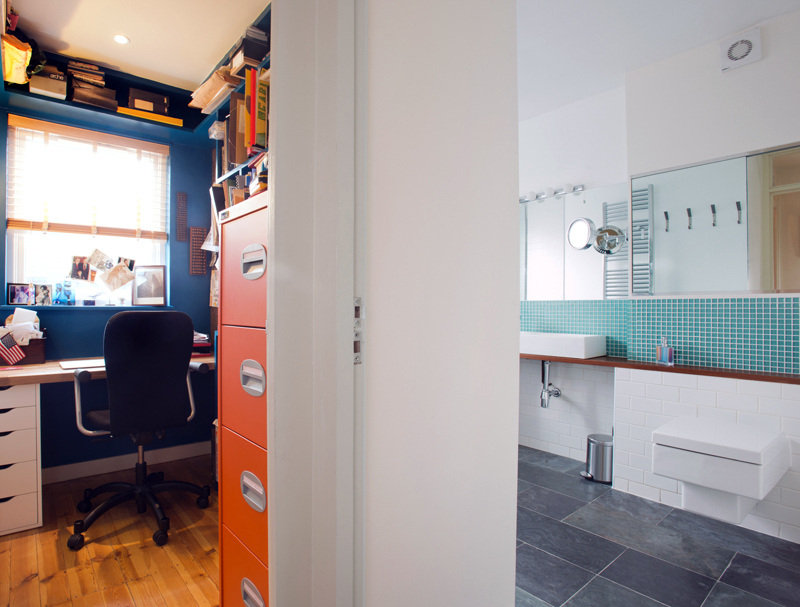 We created a much bigger, lighter bathroom by rearranging the internal layout to suit the family’s needs. To keep a consistent palette throughout the home, we decorated with similar features as in other rooms: reclaimed wood countertops, slate flooring and a tile backsplash. With a brief to create the ultimate boutique city crash pad, we introduced a bespoke kitchen and living space that was modern and luxurious. Silk curtains in a gold colour are inspired by the silk lining inside a suit, while the exposed brick wall left untouched keeps with the character of a warehouse-style loft. In keeping with the modern, sleek finish of the flat, we incorporated a statement kitchen island inspired by the look and materials of an iPhone. Bespoke open shelving and industrial light fittings all retain the warehouse-style design. The floors are a reclaimed timber treated with a white stain, which helps to reflect the light and brighten the space. We used a floor-length mirror panel in a bronze finish as a creative way to hide the boiler and other unsightly house essentials. This feature is also a nod to the opulent palette of the space and reflects even more light into the room. 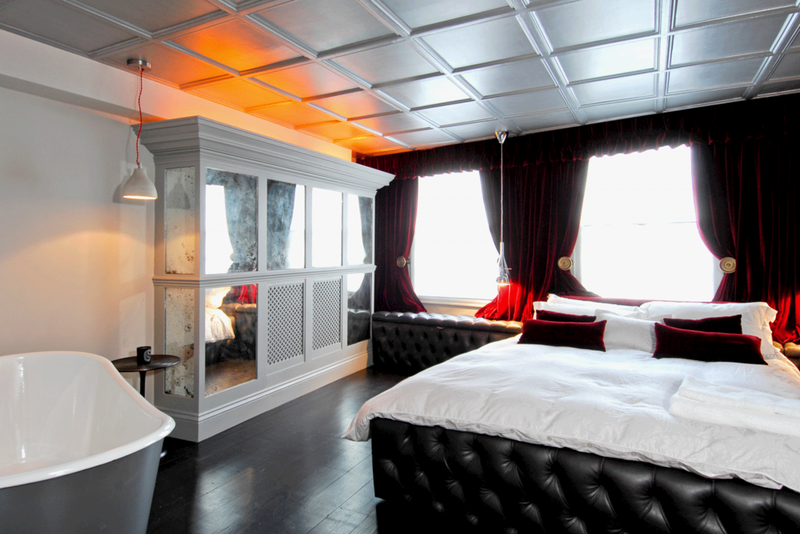 Unique features in the bedroom, such as a freestanding bath and a leather-buttoned bed base, create a high-end boutique hotel feel. Elaborate panelling helps disguise the bulky radiator and itself becomes a feature piece. The family of this house needed their ground floor space to serve as a kitchen, dining room, home office and utility room. We opened up all the rooms to create one seamless area, and we moved the kitchen to the front of the property, allowing the dining area to open out into the garden. By incorporating built-in shelving, streamlined cupboards and clever sliding doors, we made this a multifunctional living area that suits all of the family’s needs. When designing this bespoke storage, we kept the palette clean and streamlined, but we also incorporated quirky touches, all of which helped the space be both functional and fun. Sliding doors made of pegboard hide away the home office when not in use. An apple-green formica worktop adds some personality to an otherwise white, off-the-shelf kitchen. 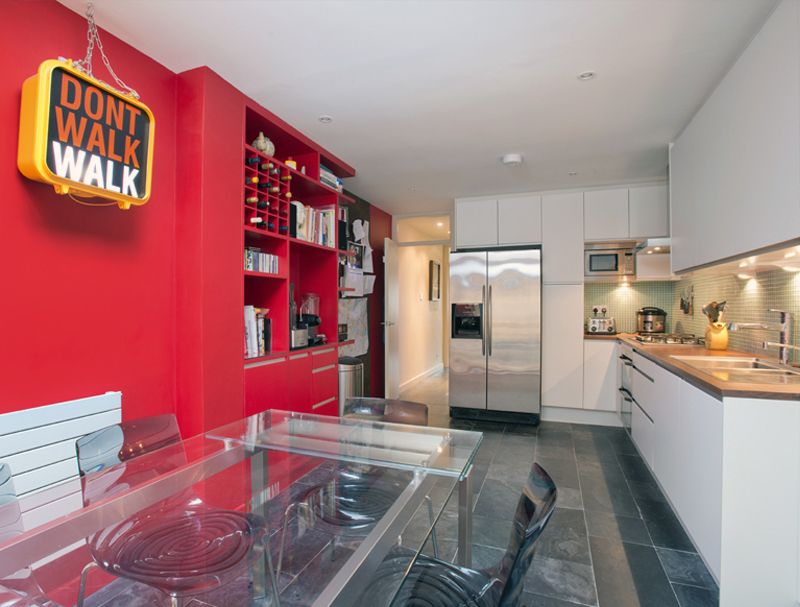 The owners of this Barbican flat requested a space that compliments their high-tech music equipment and love of listening to music. We produced a living room design that s optimised for the best sound quality and experience. Corian shelves and media unit help minimise sound reverberations, and furniture is placed in specific distances from the speakers for optimum listening. Beyond designing for music, we also had to design for a family to live comfortably in this small space. 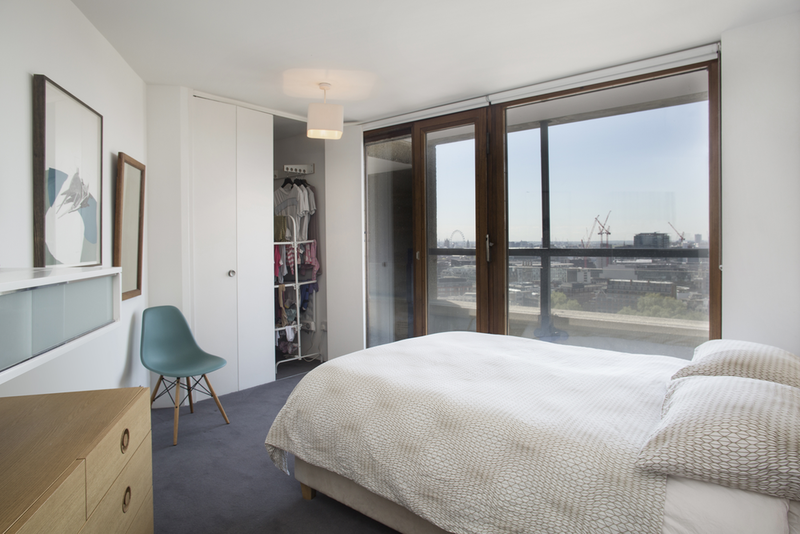 One of the features we built was a clothes-drying area and linen cupboard in the original unused Barbican wardrobe. This keeps their laundry out of sight and their space organised. One of the biggest challenges of this project was incorporating bespoke storage that not only fit the family’s items but that also works with the character of this iconic building. Our furniture makers built and fitted a shelving unit that sits perfectly under their dining window for cookbooks, kids toys and other kitchen utensils. The shelving makes use of an otherwise empty area and maximises their space and storage. 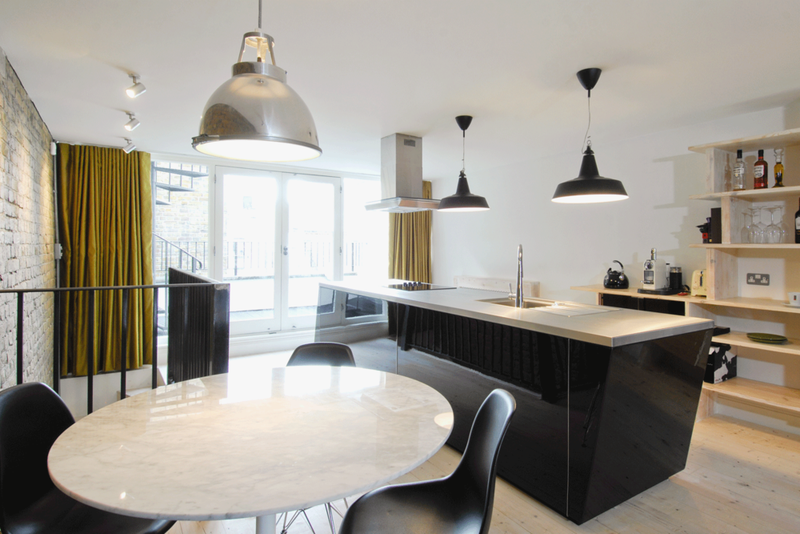 This client loves cooking and entertaining friends, but he felt the layout of his existing space inhibited this. By moving the kitchen and opening up the surrounding walls, we created a connected kitchen-living space where the client can easily entertain. We also utilised strong colour choices throughout the design to create a cosy yet impactful aesthetic. The flat originally had two smaller bathrooms in need of repair. We knocked these down to create one large, modern bathroom that is perfect for our client’s needs. We incorporated the same materials used throughout the house – such as reclaimed wood and white metro tiles – into the bathroom design to maintain a streamlined palette. What our clients are saying about Forster Inc.
“Living in a two bedroom flat with two children and working from home is a riot of toys, washing and paper. Now, at the end of the day, everything can go away and our home feels calm and organised." Want Forster Inc to make your home work for you? We do more than just choose your paint colour. Our expertise lies in maximising space efficiency, and our passion is creating beautiful and functional homes that work for you. © 2017 Forster Inc. All Rights Reserved.